As the end of the year draws closer, I find myself trying to catch up on some older reviews that I haven’t gotten around to yet. So in order to save a little time and hopefully fit more things into my schedule, I’m going to have a few “quick looks” at some repaints. Some of my most favorite Transformers toys have come from Prime’s First Edition line, and their version of Starscream is at the top of my list. This figure’s sculpt and articulation exude personality and I find myself picking up each repaint that comes down the line. 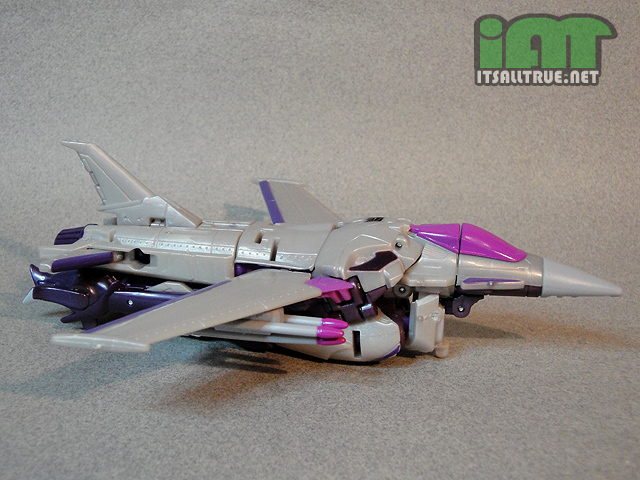 This particular version comes from the Bumblebee vs. Starscream Entertainment two-pack. This set original came with another version of Bumblebee and posed figures of Silas and a MECH soldier. Luckily I was able to skip out on the other figures from the set thanks to a fellow collector in Australia (Thanks again, Tom!). This is great news for my collection, but a bit monotonous for a review since I’ve technically looked at this figure three times already. 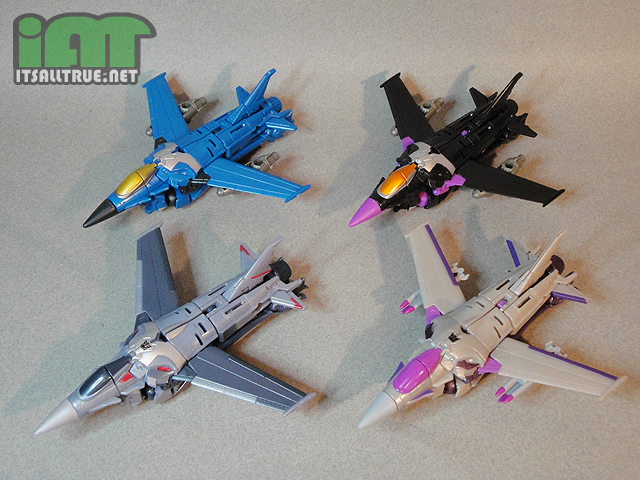 So instead of a full review, I’m just going to mention a couple things and leave you with some pictures. This biggest difference with this figure is his paint job. 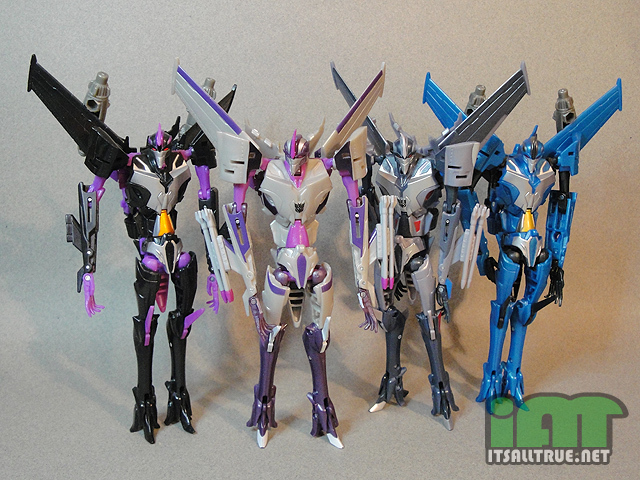 The darker and more metallic grays and silvers of the original Starscream have been replaced with light gray and highlights in purple and white. At first I was trying to figure out who this new addition to my jet army could be, but a quick look at TFwiki led me to the conclusion that he could easily be one of the many nameless gray/lavender Seekers that popped up in the background of the original show. Although this figure was readily available in Asia, he’s still a product of Hasbro and not Takara. So instead of the glued on bombs, this Starscream get the double missile pod that can attach underneath his wings or on his forearms. I’m actually glad that the Takara and Hasbro figures have different weapons. It helps add a bit of diversity to the growing ranks that use this mold. Now if only they could figure out how to do a few cone heads. 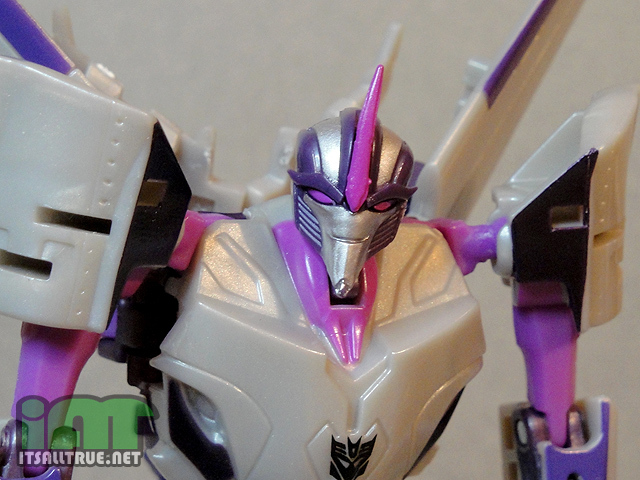 If you’re interested in more about this figure, check out my other Seeker reviews here. 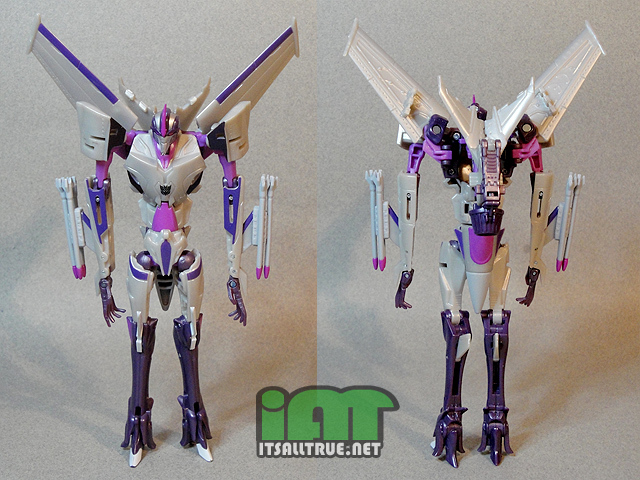 Tags: 2 pack, Bumblebee, Entertainment pack, Hasbro, MECH, Prime, Silas, Starscream, Takara, Transformers, variant, vs.
I’m surprised Hasbro hasn’t made a G1 Repaint of this Starscream. Give them time, I’m sure they will eventually! so this was a box set? or a 2pk bundle Hasbro pouts out every year? I picked up that 8-pack on Black Friday. The masked Whiplash is the Comic Series version, while cyborg War Machine is the “Modern” version. Those two–along with Ultimate Iron Man and Comic Series Mandarin–were the hard-to-find Series 4 of the Iron Man 2 4-inchers. Lo and behold, I snagged all four for $20 (along with four decent Captain America repaints!). I think they were $25 at my WM? Decent price if you have several kids to buy for, or want some custom fodder, but those two were the only ones who caught my eye in that pack (Volstagg and random movie Thor, Green Skull, and some Cap variants). I prefer the 6″ scale, anyway. I’m hoping for the reviews of the Series 8 Lego Minfigures. I always love the pics and captions. Series 9 will be released soon!